Tripod Beta: Guidance on using Tripod Beta in the investigation and analysis of incidents, accidents and business losses is the current manual on using the Tripod Beta methodology. This publication describes the Tripod Beta incident investigation and analysis methodology, giving step-by-step instruction and detailed guidance for both new and experienced users in the application of Tripod Beta. 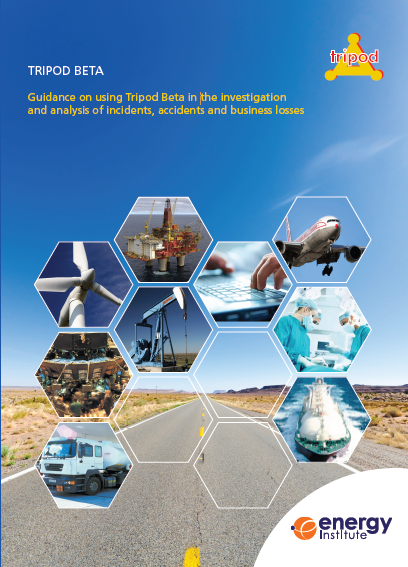 It is recommended reading for anyone looking to apply a consistent and robust incident and accident investigation and analysis methodology, particularly incident investigators, as well as those who have undergone training in Tripod Beta. Cross-references made to EI Learning from incidents, accidents and events throughout. Removal of the term ‘sub-standard acts’ throughout. This term suggests a judgement of the individual’s actions, and gives the mistaken impression that Tripod Beta is about blaming individuals, whereas in fact this is antithetical to Tripod. ‘Action’ or ‘omission’ are the preferred terms. Reference made to Chartered Institute of Ergonomics and Human Factors whitepaper Human factors in barrier management, which provides an interesting, and potentially useful, definition of a ‘barrier’. Figure 2 preconditions box now reads 'Error/violation promoting conditions/perceptions/beliefs'. Figure 3 has been simplified to only show failed barriers. Section 3.3.1 table 10: clarified that inadequate barriers should be explained using a full causation path, whereas missing barriers can be explained with either a full causation path or underlying cause only. Likewise, it is now made explicit on page 63 that the full causation path is permitted for missing barriers. Clarified on page 30 and page 91 that trios without a barrier do not need to be collapsed if it is clearer to include them in the diagram. 'Reckless' violations added as a category to the human failure taxonomy in figure E.1, and 'Reckless' and 'Unintentional' violations added to figure 15 for consistency. Chess board now used in figure E.2 to illustrate conscious behaviour. 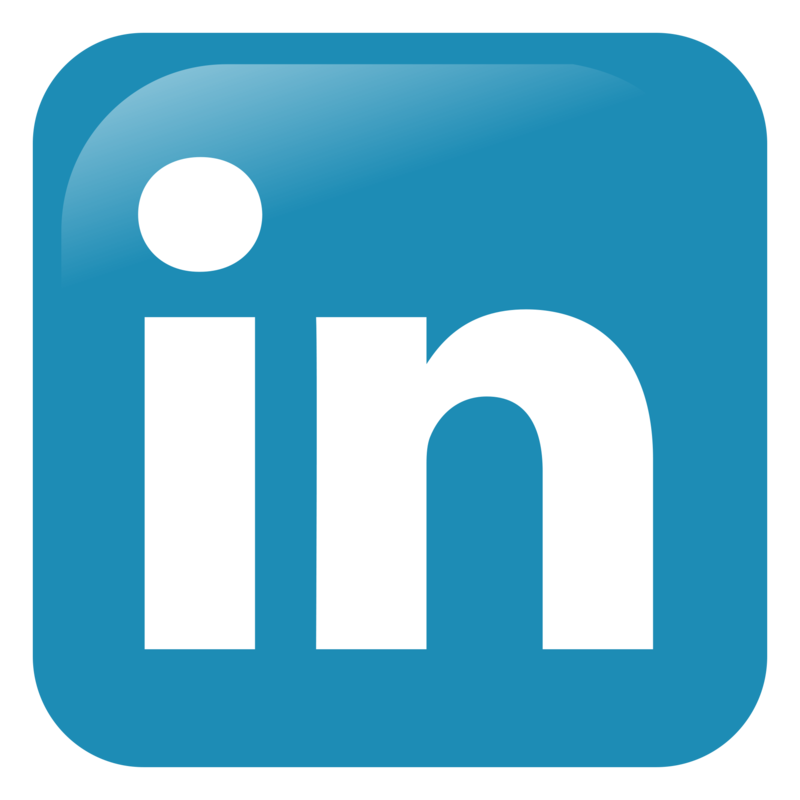 Each company has its own organisational culture, within which reside a number of processes or systems, e.g. the HSE management system, and quality management system. One element in these systems will be a process for incident investigation, analysis and reporting, the purpose of which is to identify why things went wrong so that they can be corrected and future losses and business interruptions prevented. The steps in this process start with initial fact finding followed by detailed investigation, testing and analysing facts and assumptions, and formulating corrective actions to improve the management system and organisational culture that allowed the incident to occur. Developed in the early 1990s, Tripod Beta is an incident investigation and analysis methodology designed in line with the human behaviour model. 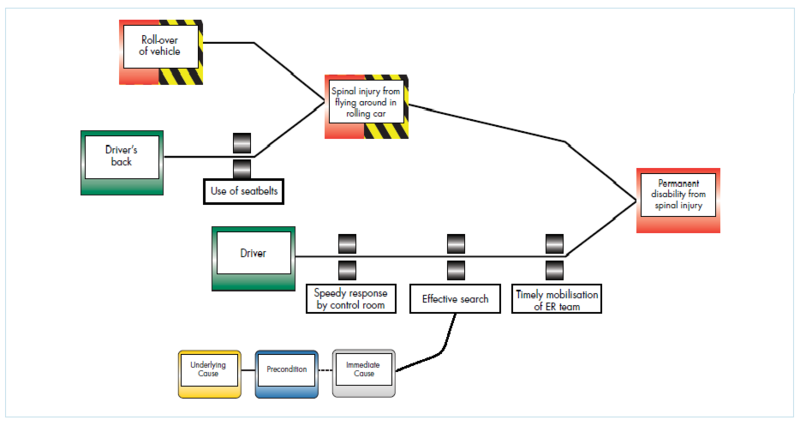 It was explicitly created to help accident investigators model incidents in a way that allows them to understand the influencing environment and uncover the route organisational deficiencies that allowed that incident to happen. Using Tripod Beta, incident investigators model incidents in terms of: objects (something acted upon, such as a flammable substance or a piece of equipment), agents (something that acts upon objects, such as a person or a fire) and events (the result of an agent acting upon an object, such as an explosion). Working back from the 'main event' (the incident), this allows us to understand fully what happened and how an incident happened. To understand why the incident happened, the next step is to determine what barriers where in place to prevent those objects and agents acting in the way they did and why they failed. Tripod Beta teaches us to look at the immediate causes of either the act that led to the incident, the psychological precursors to that, and ultimately underlying organisational deficiencies. In the Tripod Beta methodology the investigation process goes hand-in-hand with the analysis process. From the preliminary investigation report, possible Tripod Beta models of the incident are produced which leads to further investigation and fact finding which in turn leads to a validation and refinement of the model. This continues until all relevant facts have been identified and the ‘Tripod Beta tree’ accurately reflects the incident. The result is a saving in time and effort, a deeper and more comprehensive analysis and a clearer understanding of the failures that must be addressed in order to make significant and lasting improvements in incident prevention. The methodology can be supported by software that provides the means to collect and assemble the facts from the investigation and to manipulate them on screen into a graphical representation of the incident and its causes.